UN/ISDR and the United Nations Children’s Fund (UNICEF) have together produced an educational kit for children called “Let’s learn to prevent disasters!”. It includes the board game “Riskland” whereby players learn about what they can do to reduce disaster impacts by answering questions and advancing along the board’s winding path. The kit and game may be adapted according to the different hazards communities face, and translated into multiple languages. To date, the kit is available in English, Haitian Creole, Maya Kackchiquel, Nepali, Portuguese and Spanish, with translations into over 15 others currently underway. Translate and adapt the educational kit and Riskland for your community! 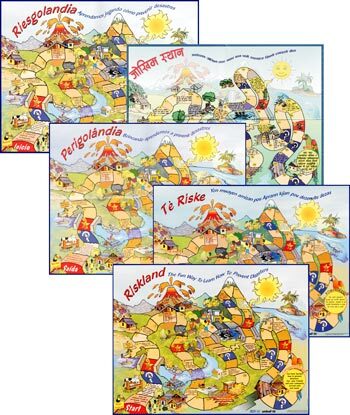 UN/ISDR and UNICEF are pleased to provide the text and artwork of the educational kit “Lets learn to prevent disasters!” and Riskland game for adaptation and translation to raise awareness of disaster risk reduction. The educational kit and Riskland may be adapted as appropriate. For example, the basic idea for the kit may be used but instead accompanied by drawings created by a local artist. Alternatively, the original artwork or text may be changed to reflect local hazards, culture and conditions. Even if the kit may already exist in a given language, a country or region may prefer to adjust the language and drawings to reflect local expressions or characters. The only limit is your imagination! We request that all reproductions of the education kit include the ISDR and UNICEF logos (available on the CD-ROM with the artwork). For alternative formats of the logos and requests to include logos of other participating organizations, please contact UN/ISDR. We would appreciate for 5-10 copies of the new version to be sent to UN/ISDR to further promote and encourage inter-regional experience sharing and information exchange in disaster reduction. 5 Can we prevent disasters? Know the dangers and get going! Get going! Draw a risk map of your community! Get going! Get emergency kit ready! 9 How does it feel like when there’s a disaster? 10 Express yourself through art!